We encourage all pyrotechnics users in Australia to read their local state and territory regulations for explosives and fireworks. Howard & Sons Pyrotechnics only sells pyrotechnic devices to licensed pyrotechnicians or organisations. A copy of a valid licence must be provided for each purchase. In Australia, state governments regulate dangerous goods, explosives and fireworks. 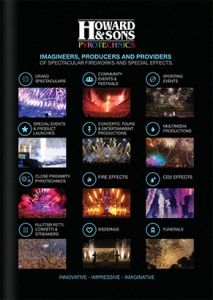 For more information on Howard & Sons Pyrotechnics Manufacturing Pty Ltd terms and conditions of sale download the PDF here.